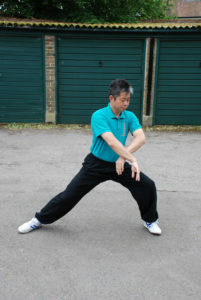 The higher the level of Taijiquan 太極拳 we want to reach the longer it takes. It is always easy in the beginning. When we do not know anything, to do something which looks something like what we see is quite easy, and so in the beginning we feel like we improve more quickly. When we know more about it then we really know what we are trying to improve and this takes much longer. Reaching Level III, 30% Yin and 70% Yang, takes at least three years of regular training. The more we practice, the more we learn from our Sīfú師父, will help us to eventually reach that Level. However in the Taiji poem it says about Level III, “30% Yin and 70% Yang is still too hard 三陰七陽猶覺硬.” This means your movements are getting better, gentler and softer, but when compared to a very good level of Taijiquan it is still too hard. Of course it is not stiff like it was in Level I and Level II but it is still too hard. When you are doing Tui Shou 推手 with an opponent who has a very good level, they can easily control you and use your energy. In Level III we can use our own energy to push someone junior but when we try with a senior we will find ourselves stiff, easily controlled and easily unbalanced. Also we use energy because we are trying to do something, however we will find that our seniors are strong and powerful and do not use much effort. They are soft on the outside but strong on the inside and this is a very good level of Taijiquan.